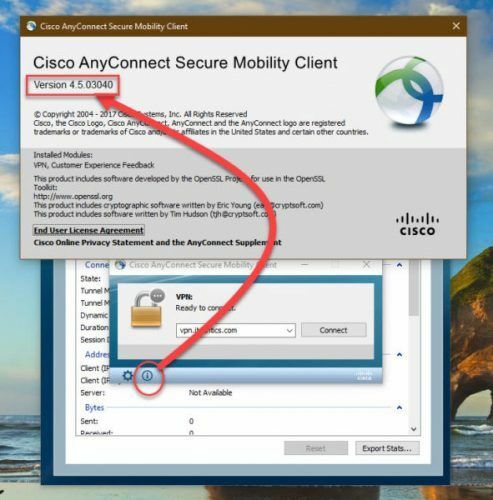 The latest version of Cisco AnyConnect Secure Mobility Client 4.6 is available for download. We will provide the direct download links of Cisco AnyConnect software on this page. If you want to download a specific version, you can download it at the end of this article. Cisco AnyConnect Secure Mobility Client is a web-based VPN client which does not need any client end configurations. AnyConnect is not limited to providing only VPN functionality but it also comes with other features which enable an enterprise to secure its endpoints. Other features of AnyConnect include telemetry, web security, network access management, etc. But overall, it is only useful for those who are already using Cisco services. AnyConnect is known to provide the best security and connection/re-connection even on public networks where Internet connectivity is not stable. It also provides the feature of multi factor authentication thus making your system or network more secure. The additional features involve Cloud Web Security, VPN Posture ,ISE Posture, DART, Customer Experience feedback, network visibility module, AMP Enabler, Umbrella Roaming Security. The VPN Posture Module provides the ability to identify the operating system, anti-malware, and firewall software installed on the host. The VPN Posture (HostScan) Module requires HostScan to gather this information. Java Runtime Environment is required before installing the Anyconnect. You can install Java 8 latest update. I have also tried running Cisco AnyConnect 4.6 with Java 11 installed and it is running perfectly fine. I haven’t tried the web version. You may need to install Java 8 for running the web version of the Cisco VPN client but I’m not sure. If you have previously enabled the option that only trusted websites can access, then the URL of the server should be added. Go to Windows Settings and search for Internet Options. 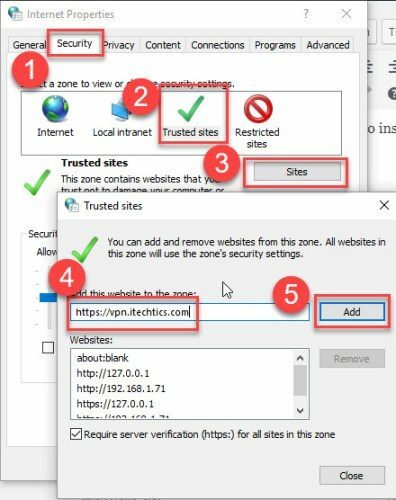 Then go to Security tab and Select Trusted Sites and add the server URL in trusted sites. Using AnyConnect is easy. Just add the VPN server URL and click Connect. This will create a secure VPN connection to the Cisco systems VPN router. You can now browse the resources in the remote network securely. All the traffic is passed through the VPN tunnel meaning that no one can read the information except the server and the client. Click on the i (information) icon near the gear icon on the bottom left of the client window. This will show the complete version no. of the VPN client running on your computer. If you are not running the latest version of AnyConnect, you can download it from the links given below.